Back before I knew what to do with StarHammer I briefly considered pitching it to Amazon Studios. It still had Evey at the center of everything, but lots of things were different. Izzy had yet to exist. Evey's best friend was still Kate Larkin. Danae Thompson was a man named Danny Thompson instead. And a lot of the characters were a bit younger. The main villain was a guy named Frank Lindsay. He'd sculpt dangerous creatures and bring them to life and wanted to ruin the StarHammer legacy. There were other major characters like Archive, a man who could absorb the information and contents of a book or computer simply by touching it. While getting it prepared for a proper pitch I decided I wanted to hold onto it myself. And that brings us to the StarHammer we have today. Everyone on StarTeamGO! would love to see an animated series or something of that nature. Whether it'll happen or not remains to be seen. But we'll be trying our own hand at some odds & ends in the meantime. 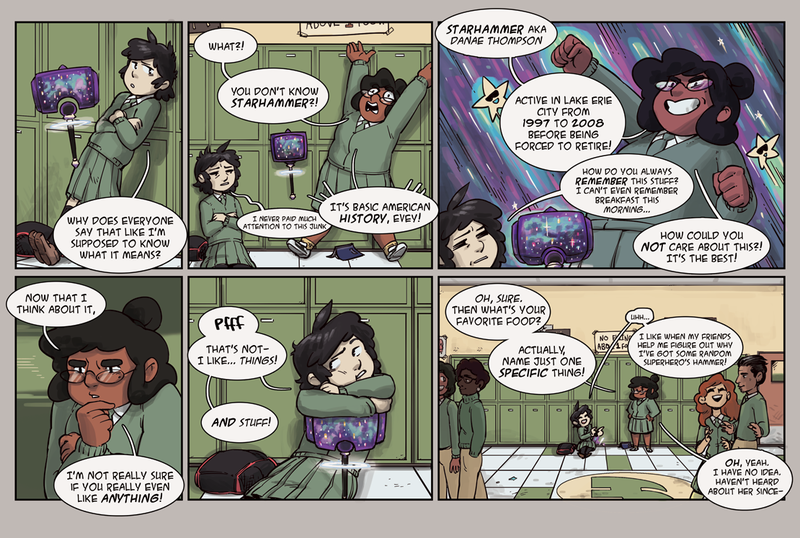 Here's something whipped up by our colorist/letterer Tessa Kleiner.